There are many variations of this dish. 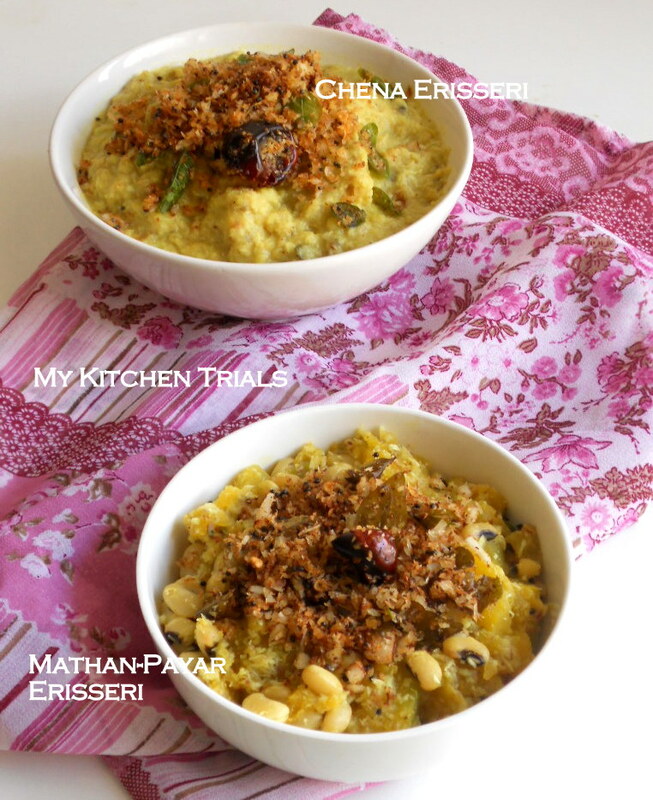 Popular ones are Pumpkin & Red bean (Vanpayar) combination and Yam- Raw banana combination. Coconut is fried till brown and then added to this curry at the end, which gives such a pleasant aroma & taste to this dish. This is very much like the Koottu Curry of North Kerala. The cooking process is very similar. For Koottu Curry, small black chana is used. In the Trivandrum side, Koottu curry is a totally different recipe. It has vada (lentil dumplings) and potatoes and masala added to it. This is my understanding, let me know if you a bit more about this dish. I love the pumpkin erisseri. I make it frequently at home now. Here, I have made erisseri with yam alone. The other one is pumpkin – lentil variety. Yam and raw banana is a good combination for making this curry. This dish, my friend tells me, is a Thrissur specialty. That might be true, because I haven’t heard my friends from Trivandrum mentioning this curry much. 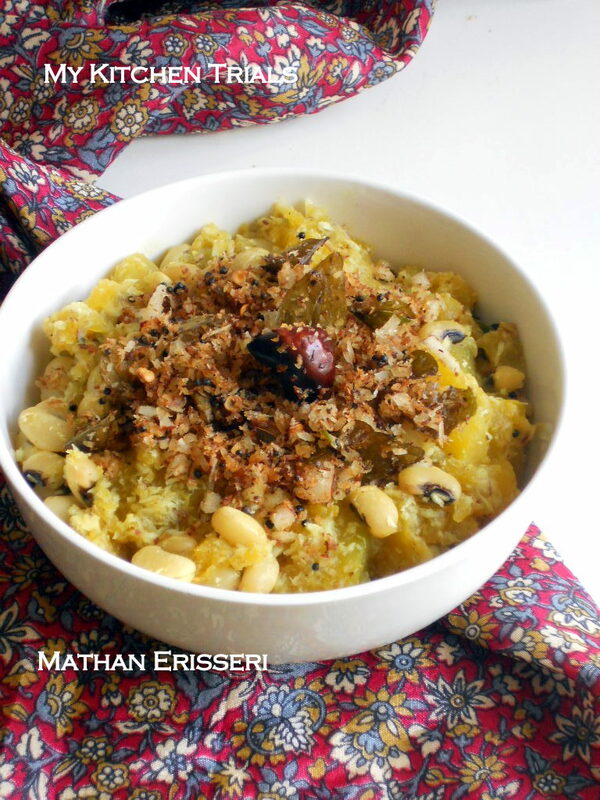 You can check out the Mathan erisseri recipe here in this link. I posted it recently in the blog. It’s now one of my son’s favorite dishes. The consistency of the dish is a semi-gravy. Its like one of those thick gravies. It doesn’t run, but it’s not dry either. The vegetables are mashed at times, but I prefer if you can see the shape of it. Some people use green chillies where as some use red chillies for spice. This dish uses pepper also for spice. This is one of the dishes my MIL makes for Shradham (yearly death anniversary function of one’s parents). She uses pepper and red chillies for the same. Its usually in the ‘must list’ for a Sadya, but this is also one of the dishes that I cut, if I have to choose between recipes. Wash and clean the yam pieces. Dice them and pressure cook with turmeric powder & water to cover it. Some cook fast while some take a lot of time, so the end result should be that yam should be cooked properly. I cook it for two whistles. Dry roast the red chillies and pepper. Grind along with coconut and cumin. You can add a bit of water and make it to a paste. When the yam is cooked and the pressure is released, transfer it to a pan and bring it to a boil. If you have added too much of water while pressure cooking them, then you need to drain off some. Basically, you can have some water, but not too much. Add the coconut paste , salt and bring it to a boil. Let it cook for 5-6 minutes. When it has reached the consistency you prefer (it’s usually semi solid), take off the heat. In a separate pan, we will get the seasonings going. Add the oil, once its hot add the mustard seeds, red chillies. Add the curry leaves once the mustard splutters. Now add the coconut and fry until its brown in color. Top this onto the prepared vegetable and mix. Serve with rice as a side dish. 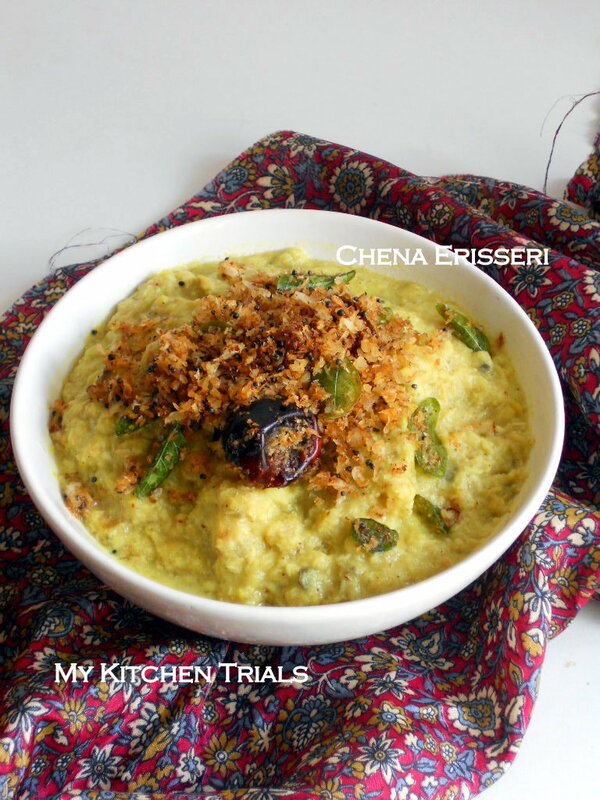 Linking this to Valli’s Side Dish Mela as well. That’s a new dish for me ! Sounds delicious .. I second Valli on this. It looks yummy and i have to try it yet. Give me that bowl, i can finish it like a snack, love erisseri to the core. Erisseri looks so yummy. Love that toasted coconut on top..
Love the post..very tempting pictures.. Very tempting as I like Yam and Pumpkin and Love Kerala food. delicious and very authentic!!! should have tasted so flavorful!! 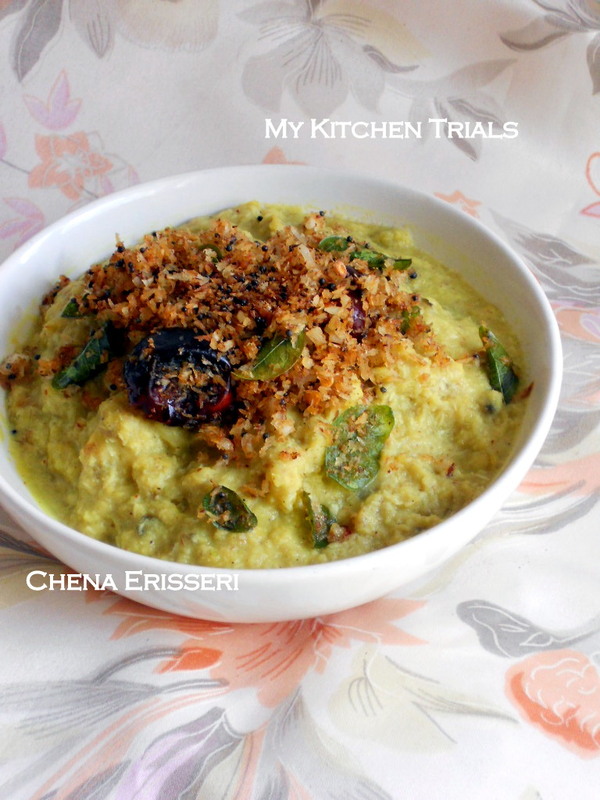 I was planning on making Erriseri for the E, but was not able to nail on an authentic recipe. Now have one to make. Lovely! I think I’d love this with yam. All your posts simply remind me of my Mallu friend’s wedding when i skipped breakfast coz I was told lunch would be a heavy affair! Superb series Rajani. Keep ’em coming!